Raymond Joseph “Jim” Yellig has received the Sagamore of the Wabash Award, Indiana’s highest civilian honor. His legacy will be honored during a ceremony at the Santa Claus Museum & Village on Saturday, February 25, 2017, at 11:00 am CT. The Hoosier Santas and honored guests will bestow the award to Yellig’s daughter, Pat Koch. Koch is the founder of the Santa Claus Museum & Village and a 2013 recipient of the Sagamore of the Wabash Award. The ceremony is free and open to the public. A wreath-laying at Yellig’s grave in Mariah Hill, Indiana, will follow the ceremony. In 2016, the Hoosier Santas launched a petition nominating Yellig for the Sagamore of the Wabash Award. “We, the members of the Santa Claus family and keepers of the Christmas Spirit,” the petition begins, “come together with one voice to request the great state of Indiana bestow its highest civilian honor to a beloved and legendary Santa.” The petition highlights Yellig’s commitment to answering letters sent to Santa Claus, his devotion to spreading Christmas joy, and his legacy within the Santa Claus community. Yellig began portraying Santa Claus in 1914, while serving in the United States Navy. 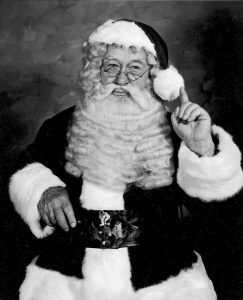 After World War I, he returned to his hometown of Mariah Hill, Indiana, and served as the Santa Claus Land (now Holiday World & Splashin’ Safari) Santa for nearly forty years. The Sagamore of the Wabash Award is a personal tribute usually given to those who have rendered a distinguished service to the state or to the governor. Among these who have received Sagamores are astronauts, presidents, ambassadors, artists, musicians, politicians, and citizens who have contributed greatly to our Hoosier heritage. HE, Santa Claus, was the original Santa! I have pics of my siblings and I sitting on his lap at age 5 and earlier. All other Santa impersonators were just that.. impersonators! Mr. Yellig was a Santa at the top level! No one could do it better. For someone to have such a wonderful passion to please others.. to be that figure that makes magic happen in the lives of the youth... he was awesome! I later worked at Santa Claus land under Joe Hevron and helped to mow or to haul trash from Mr. and Mrs. Koch's house as well. Santa Claus land provided many jobs to local kids. Great family business, great family and the vision that Mr. Yellig and Bill Koch brought to the community was insightful, visionary and successful! AS the community grew, so did job prospects. I worked in the Christmas Lake Village by clearing cattails from the lake, clearing the woods for lakeside lots and by building the golf course. These jobs helped to form me as an honest, hardworking productive Christian. Thank you to the first family of Santa Claus.